Mersey Harmony turned out on a warm afternoon and under the direction of Helen Groom sang and entertained the runners taking part in the Rock n Roll Marathon through Liverpool. 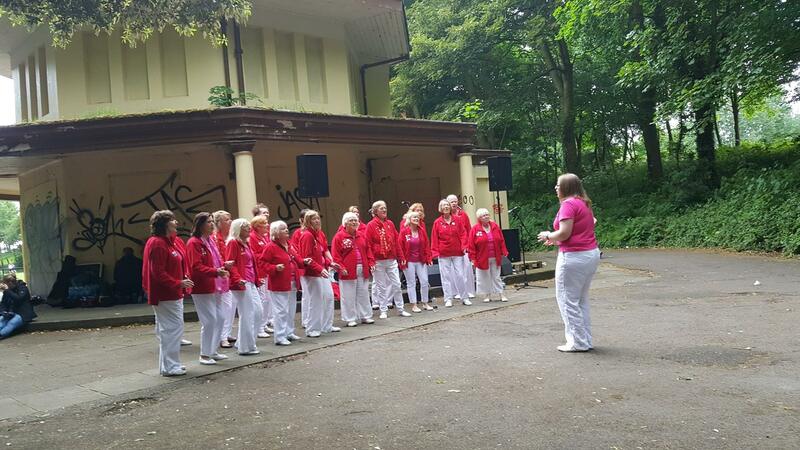 MH were sited at the Old Pavilion, Otterspool Park – a lovely setting. As the runners ran by they were clapping, putting thumbs up and taking selfies with us. In turn, after each song we were able to clap the runners. It was a great atmosphere enjoyed by all. Several Mersey Harmony members had a very enjoyable evening taking part in this year’s Light Night. The event was in the stunning Picton Room at Liverpool Central Library and the amazing Jennifer John from Sense of Sound had written a song for the occasion. The song had never been performed before. It is called “Love Sings” and in just an hour a group of around 80 singers sang this piece in 5 part harmony – marvellous. Love sings is a new initiative led by Jennifer to bring choirs, individuals and communities together in celebration of song. Its main focus will be massed singing events throughout the year so watch this space (or keep your eyes on the tick lists) for the next event.